Japan’s participation in a NATO missile development consortium could lead to multi-national projects in Asia. Ever since Prime Minister Shinzo Abe’s return to the top in Tokyo in December 2012, Japan has steadily been increasing its defense cooperation with a range of partners, both in Asia and elsewhere. Abe has spearheaded defense commerce, research and development, and production cooperation with a range of states, including the United States, United Kingdom, France, Australia, and India. To enable this profusion of collaborative activity, Abe’s government lifted Japan’s decades-long self-imposed arms export ban (based on the “three principles” of not exporting weapons to communist states, states involved in conflict, or states subject to United Nations embargoes). The next step for Tokyo as it looks to become a “normal” state, as far as international defense commerce is concerned, may be participation in a NATO missile building consortium. According to Reuters, Tokyo is considering collaborating with NATO in what could be its first multinational defense project. Japan is considering participating in the 12-country NATO consortium which manages the development of the Sea Sparrow family of ship-borne missiles. The consortium includes Australia, Belgium, Canada, Denmark, Germany, Greece, Netherlands, Norway, Portugal, Spain, Turkey and the United States. Australia is currently the only non-NATO member of the consortium, and elected in 2014 to continue its participation in the group. 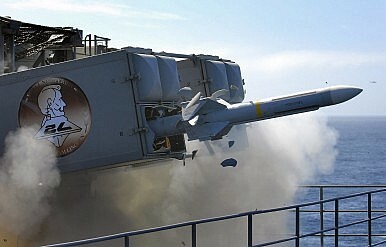 With a unit cost of $165,000, the Sea Sparrow, manufactured by U.S. firms Raytheon and General Dynamics, is designed to counter and destroy anti-ship sea-skimming missiles and attack aircraft. The NATO consortium will work toward a next-generation upgrade for the Sea Sparrow in the coming years. Japan’s Maritime Self-Defense Force operates the RIM-7 Sea Sparrow and RIM-162 Evolved Sea Sparrow (ESSM) missiles, which are assembled in Japan by Mitsubishi under a coproduction agreement with NATO and the United States. According to the Reuters report, citing a U.S. source, Japanese naval officers discussed their country’s participation in the consortium during a May trip to The Hague. The report adds that “Two Japanese sources familiar with the initiative said discussions in Tokyo were at an early stage, although joining the consortium would dovetail with Prime Minister Shinzo Abe’s more muscular security agenda, which included the lifting last year of a decades-old ban on arms exports.” Japan’s inclusion in the new Sea Sparrow consortium would alleviate the cost burden for the 12 existing members of the group, and give Tokyo an opportunity to work on a multinational defense project. Interestingly, the report notes that the United States (at least, based on the comments of one source with knowledge of the process) sees Japan’s participation in the Sea Sparrow consortium as a stepping stone to Tokyo initiating its own multi-nation defense initiatives in Asia to offset China’s military modernization and assertiveness. “We think this project will allow Japan to lay the groundwork for further defense export programs in the future,” a U.S. source told Reuters, adding that Washington “would welcome this kind of security cooperation activity by Japan in the region.” Given Japan’s growing ties and defense collaboration with countries like Vietnam, the Philippines, and even India, the potential for multi-national projects could be promising. Japan, a U.S. ally, is not a member of NATO, but cooperates closely with several NATO member states. NATO has described Japan as its “longest-standing partner across the globe,” and contacts between the organization and Tokyo have growing since the end of the Cold War. In 2013, Abe and then-NATO Secretary General Anders Fogh Rasmussen signed a Joint Political Declaration which set out a framework for NATO-Japan cooperation and highlighted a set of guiding principles for cooperation between Tokyo and the organization.